This is the third section of our guide to calculating player value in fantasy football. Each part will lay out a different aspect of the process. Part I and Part II are already up, and Parts IV and V will be published on our blog throughout the week. Last week, in Part II, we finished calculating the past value of every player from the last five years. Now, we can use these historical results to project the value of each player at each positional ranking for this year in a standard league. By positional ranking I mean the first-ranked player, second-ranked player, third-ranked player, and so on at each position. So we are not projecting specific player performances, but rather the value of whatever player falls at each ranking at every position. That way, we will be able to say that if C.J. Spiller is your projected third-best running back, he should have approximately *this much* value. 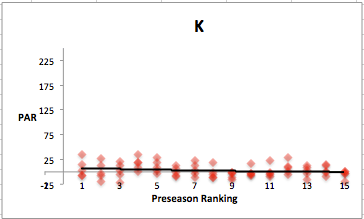 In order to find these projected values for each position, we take the last five years of data, and find a line of best fit for the relationship between preseason ESPN consensus ranking and actual seasonal value. This gives us an equation that predicts seasonal value, and we can plug in each ranking to find its expected value based on player performances from 2008 to 2012. This expected value is our projection for this year. First off, we see that better-ranked players tend to accrue more value (in terms of PAR) than players with worse rankings. Not exactly groundbreaking, I know. 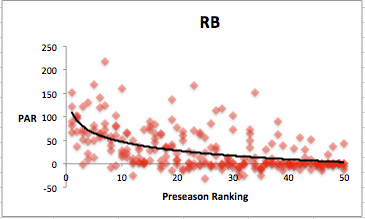 It also looks clear that running backs have more spread between the players with high and low rankings, while defenses and kickers have almost none. This will be critical in our value calculation later. 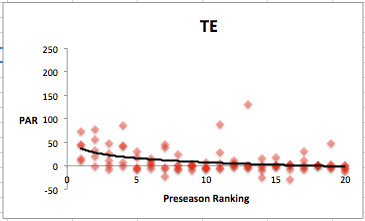 The r-squared values tell us what percent of the variation in expected value is due to variation in preseason ranking, so the higher the r-squared value the more predictable a position is for the season. From most to least predictable, we have RB, QB, WR, TE, DEF, and K. The lines of best fit for QB, RB, and TE are logarithmic, which indicates that we can expect a faster rate of increase in value for the elite players at these positions than at WR, DEF, and K. It’s telling to see wide receivers grouped in with kickers and defenses in this comparison. 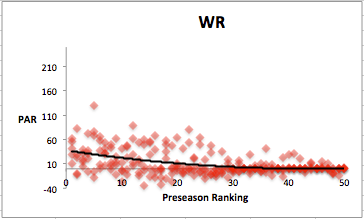 Wide out performances for the whole season are much less differentiated than at the other skill positions, just as they were for weekly performance. At least they are more predictable than defenses or kickers, who are close to totally random. 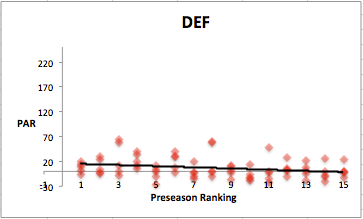 After looking at the shape and spread of the data, the next thing you might have noticed is that the regressions predict more players to hold positive seasonal value than there are available starting spots in a standard league. 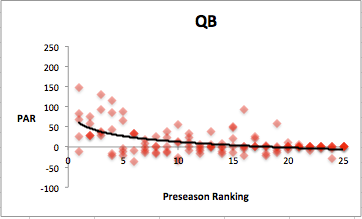 For example, eighteen quarterbacks have a predicted full-season PAR above zero, with room for only ten starting quarterbacks. This result backs up my Manning-Roethlisberger example from Part I. While there is only room for ten QB’s in the seasonal top ten, the guys that occupy that starter territory from week to week can and do change. So while only ten guys can be the ten best guys for the season (by definition), more players (in this case eight more) should also achieve a positive cumulative contribution by gaining relevance for just a week or two. There are actually more projected players than available starting spots for every position, so this concept applies across the board. So when you see this trend, now you know that having so many guys with projected positive value is not a mistake- it reflects how the value distribution actually looks. It looks like we finally have our final projected values for each player at each ranking, but, unfortunately, our work is still not done. We have to make adjustments for the structure of the draft and the presence of in-season free agency to actually calculate draft, auction, and trade prices/values. Our journey will continue tomorrow as we make these corrections and get our final values at last. I know that drafts have already happened, but all of this still applies to in-season valuation for making trades, so stay tuned for Part IV this week.